The theme of the leadership conference was “Access” to care for women’s health. Each ACOG district met with their U.S. Senators and congressional representatives to lobby for continued support of the Maternal Mortality Act of 2018 and preserving the pre-existing condition benefits of the Affordable Care Act. 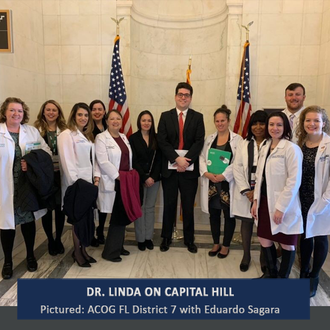 I am happy to report that my Congressional Representative, Stephanie Murphy’s office and Senator Mark Rubio's legislative aide, Eduardo Sagas, were cordial and open to our suggestions which are a testimony to the power of bipartisanship. It is common knowledge that there is an effort to dismantle the Affordable Care Act but what you may not be aware of is the “junk” healthcare plans they are proposing as a replacement. The incumbent administration is endorsing these “short term” disability plans and trying to extend them for three years. While these plans appear to be cheaper in price, they offer NO health care benefits to women such as mammograms or maternity health. ACOG is lobbying to keep these plans at three months and not have them extended to three years.